"A dazzlingly choreographed network of echoes and mirrorings" T.L.S. It takes the form of personal and formal investigations into two political assassinations - the murders of Rafael Uribe Uribe in 1914, the man who inspired Garcia Marquez's General Buendia in One Hundred Years of Solitude, and of the charismatic Jorge Eliecer Gaitan, the man who might have been Colombia's J.F.K., gunned down on the brink of success in the presidential elections of 1948. Separated by more than 30 years, the two murders at first appear unconnected, but as the novel progresses Vasquez reveals how between them they contain the seeds of the violence that has bedevilled Colombia ever since. 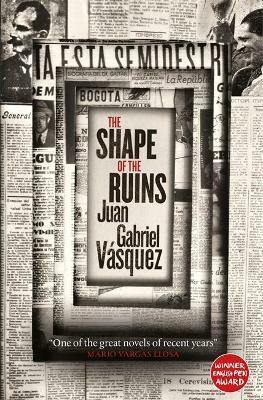 The Shape of the Ruins is Vasquez's most ambitious, challenging and rewarding novel to date. His previous novel, The Sound of Things Falling, won Spain's Alfaguara Prize, Italy's Von Rezzori Prize and the 2014 Dublin IMPAC literary Award. Juan Gabriel Vasquez was born in Bogota in 1973. His previous books include the International IMPAC Dublin Literary Award winner and international bestseller The Sound of Things Falling, as well as The Informers, The Secret History of Costaguana and Reputations, which was awarded the Royal Spanish Academy Prize. He has translated works by Joseph Conrad, John Dos Passos and Victor Hugo, amongst others. His books have been translated in twenty-eight languages and forty countries. In 2016 he was made Chevalier de l'Ordre des Arts et de Lettres by the French Ministry of Culture. After sixteen years in France, Belgium and Spain, he now lives in Bogota.